Exercise can sometimes turn tragic in unforeseen circumstances.The security of some soldiers is currently worrying their state and families after two air crafts collided and crashed into the sea. One Marine was rescued and was “in fair condition”, while another one “has been declared deceased”, Marines officials said in a statement. 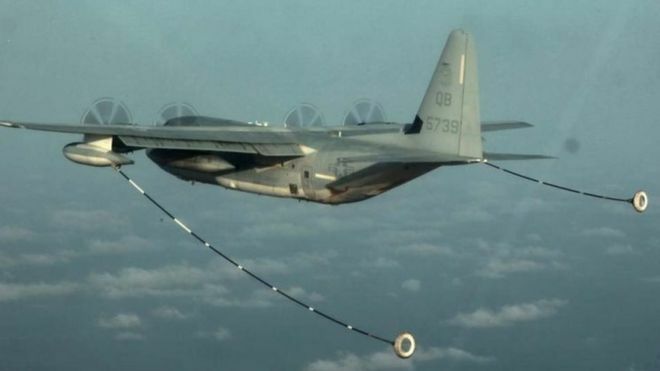 The planes involved were a KC-130 and an F/A-18 based at Iwakuni near Hiroshima, south-western Japan. The Marine Corps has not officially confirmed this, describing the incident as a “mishap”. Japanese Defence Minister Takeshi Iwaya said Japanese aircraft and three vessels were taking part in the rescue operation. The US 7th Fleet is supporting the operation, with navy aircraft being deployed. The Marines Corps tweeted that the incident occurred at about 02:00 local time on Thursday (17:00 GMT Wednesday). The first Marine was rescued about four hours later, Japanese officials said, while the second was found 10 hours after the collision. They said one of them was from the fighter jet. Japan said the search operation would continue overnight, Japan’s NHK World reports. It quoted the head of Japan’s Self-Defence Forces, Katsutoshi Kawano, as saying that search teams had spotted debris floating in the sea. Do you trust the search will be successful?